Accretion discs are components of objects as diverse as protoplanetary systems, active galactic nuclei, cataclysmic variables or X-ray binaries. Often, a high fraction of the luminosity of these systems is generated by the accetion disc itself. To understand these objects and interpret the observational data of increasingly high quality a realistic physical model of the accretion disc is necessary, the physical processes in the disc should be considered as accurate as possible. Our contribution to this field is the determination of accretion disc parameters like the mass accretion rate, radial extension, inclination, chemical composition, radius and mass of the central object, by means of spectroscopic analyses. This requires high quality spectra from ground and space based observatories covering the spectrum from X-rays to the infrared as well as sophisticated computer simulations of the interaction between the radiation field with the hot plasma in the accretion disc. Spectroscopic analyses require the comparison of accretion disc spectra with synthetic ones. Accretion disc spectra are obtained at ground (e.g., Very Large Telescope VLT, ESO) or space based observatories (e.g., Hubble Space Telescope HST, NASA). Synthetic spectra are obtained from the solution of the radiation transport equations, describing the propagation of light through the vertical layers of a accretion disc. On one hand, this solution necessitates the knowledge of the physical conditions like temperature, density, mass accretion rate, viscosity and occupation numbers of the atomic levels of the plasma in order to determine its opacity and emissivity. On the other hand the radiation field interacts with the plasma and changes its physical conditions. While in stars similar to our sun, the occupation numbers of the atomic energy levels can be determined with sufficient precision from the assumption of a local thermodynamic equilibrium (LTE) this is not the case for accretion discs with an effective temperature range up to several 10000K. The level population in the non-LTE case is obtained by balancing all populating and de-populating processes from each atomic level assuming stationarity (statistical equilibrium). The complete problem is a non-linear system of integro-differential equations. Its solution requires a very efficient numerical iteration scheme, comparable to the case of stellar atmospheres. AcDc is a software package for the modelling of vertical structures and NLTE spectra of accretion discs, developed by Thorsten Nagel. It is related to the Tübingen NLTE-Model Atmosphere Package TMAP. In the case of a geometrically thin alpha-disc, where the disc thickness is smaller than the disc diameter, the radial and vertical structure equations can be decoupled. Under the assumption of axial symmetry and by dividing the disc into concentric rings the determination of the vertical structure becomes a one-dimensional problem. The equations of radiative and hydrostatic equilibrium as well as the rate equations for the population numbers of the atomic levels are solved consistently with the radiation transfer equation under the constraint of particle number and charge conservation. Irradiation of the accretion disc by the central object can also be considered. The disc spectrum is calculated for different inclination angles, and the spectral lines are Doppler broadened according to the radial component of the Kepler rotation. AMCVn stars are close, interacting binary systems with very short orbital periods of 5-65 minutes. Their spectra are dominated by helium lines. The accretor is a white dwarf (WD), whereas the nature of the Roche lobe filling low-mass donor is still discussed. It might be a helium WD, a helium star, or the helium-rich core of an evolved secondary. As the disk represents the chemical composition of the donor's atmosphere, the analysis of the disk will help to understand the donor star and the formation of these systems. 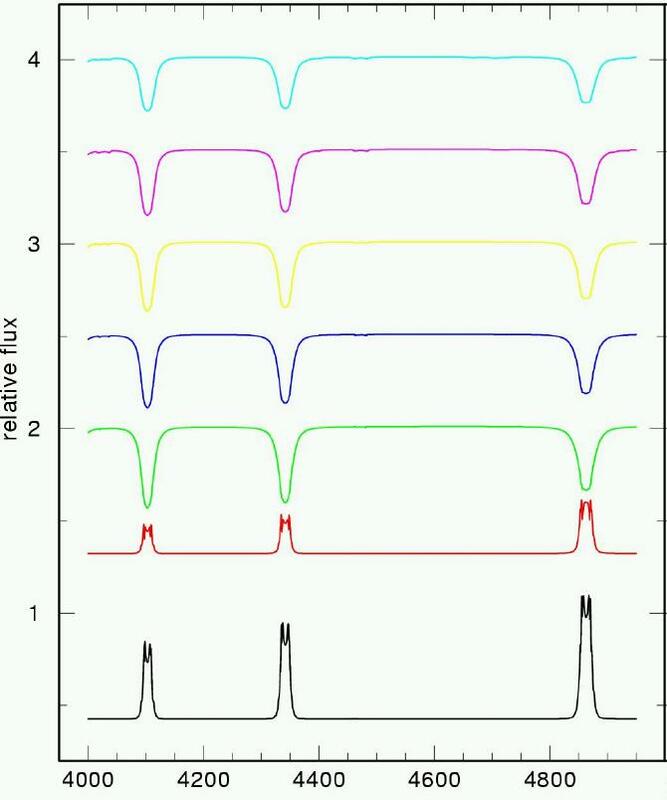 We find emission-line spectra for low and absorption-line spectra for high mass-accretion rates. Irradiation of the disk by the primary has almost no influence onto the spectrum. Comparing an observed spectrum of CE315 with our models we find the qualitatively best match for a 0.8 solar masses primary and a mass-accretion rate of 10-11 solar masses per year. The disk shows a strong silicon underabundance confirming the hypothesis that it is a Population II object (Nagel et al., 2009). sequences allow us to distinguish inside-out and outside-in moving heating waves in the disk of SS Cygni, which can be related to symmetric and asymmetric outburst light curves, respectively (Kromer et al., 2007). Our results favor the DIM. 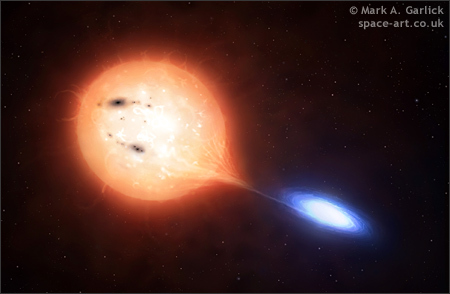 Recently, signatures of a gas disk were discovered in spectra of two DAZ white dwarfs. We concentrate on one of these, namely SDSS 1228+1040. The spectra display double-peaked emission lines of Calcium. Hydrogen and Helium emissions are not discovered. It is concluded that the Ca lines stem from a metal-rich Keplerian disk around a single WD. They can be modeled with a geometrically thin, viscous gas disk ring at a distance of 1.2 solar radii from the WD, with effective temperatures of 6000K and a low surface mass density of 0.3 g/cm3. If one assumes that the disk reaches down to the WD and has a uniform surface density, then its total mass would be 7x1021g. A rocky asteroid with this mass would have a diameter of about 160km (Werner et al., 2009). The non-detection of a point source in SN1987A imposes an upper limit for the optical luminosity. This limits the size of a possible fallback disk around the stellar remnant. Assuming a steady-state thin disk with blackbody emission requires a disk smaller than 100000km if the accretion rate is at 30% of the Eddington rate. With we have modeled the disk spectrum more realistically. The chemical composition is assumed to be pure Fe or that of a Si-burning ash. It turns out that the observational limit on the disk extension becomes even tighter, namely 70000km (Werner et al., 2007). probably the core of a stripped WD. This opens up the unique possibility to study the WD interior via an abundance analysis of the disk, which dominates the UV/optical luminosity. Our models confirm the deficiency of H and He in the disks of two analysed objects. The lack of neon lines suggests that the donor stars are eroded cores of C/O WDs with no excessive Ne overabundance. This contradicts earlier claims of Ne enrichment concluded from X-ray observations of circumbinary material, which was explained by crystallization and fractionation of the WD core. Waccabi is a code for the modelling of an accretion disc wind, using a mixture of Monte Carlo and ray tracing methods. It is currently developed by Dmitri Semionov. Wompat is a Monte Carlo based code for the modelling of an accretion disc wind, developed by Daniel J. Kusterer.